Joseph Ndo, Ross Gaynor and Lee Lynch have all signed new contracts. 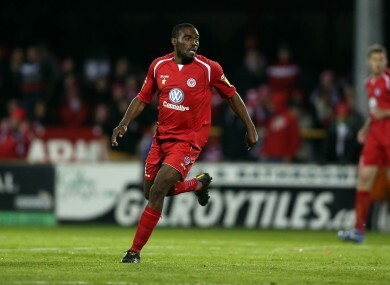 Joseph Ndo played an integral role in Sligo's title win last season. AIRTRICITY LEAGUE CHAMPIONS Sligo Rovers have received a boost with the news that Joseph Ndo, Ross Gaynor and Lee Lynch have signed new contracts with the club. All three played significant roles in the club’s title-winning campaign last season, as they each featured regularly for the club. Ex-Cameroon international Ndo has made over 100 appearances for the club since joining, while 20-year-old Lynch is regarded as one of the league’s brightest prospects, and Gaynor is also seen as an integral part of the club, contributing 11 assists last term. Sligo now have 11 players under contract for the 2013 season, with Gary Rogers, Alan Keane, Danny North, Seamus Conneely, Ryan Connolly, Jeff Henderson, Gavin Peers and David Cawley also agreeing to stay on. Email “Going nowhere: Sligo trio extend stay at club”. Feedback on “Going nowhere: Sligo trio extend stay at club”.